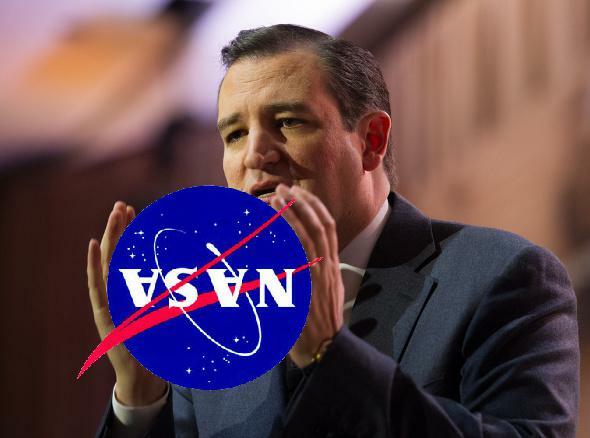 NASA trouble: Science denier Ted Cruz will oversee Senate committee for oversight. So, Sen. Ted Cruz (R-Texas) was just named to be the chairman of the Subcommittee on Space, Science, and Competitiveness as Republicans take over the Senate. This subcommittee (which used to be just Space and Science but was recently renamed) is in charge of oversight of, among other things, NASA. This is not a good thing. Just how bad it is will be determined. Before I rip into this, I want to be as fair as possible here: Poking around the Web, I don’t see any statements from Cruz that I’d consider directly antithetical to NASA’s efforts specifically to explore space. For example, in 2013 he wanted to reduce NASA’s budget, but that was more so that it would comply with the caps set by the Budget Control Act. In fact, he made a statement saying, “Proceeding with an authorization while pretending that the existing law is something other than what it is, is not the most effective way to protect the priority that space exploration and manned exploration should have.” That’s at least superficially heartening. The last 15 years, there has been no recorded warming. Contrary to all the theories that—that they are expounding, there should have been warming over the last 15 years. It hasn’t happened. This is, to put it mildly, what comes out of the south end of a north-facing bull. Yes, the Earth has warmed over the past 15 years, and the science is incredibly, unequivocally clear about that. Anyone making this claim either doesn’t know what they’re talking about, or is trying to sell you something (or, to be more accurate, has been bought). Cruz has even joked about it, the punch line of which depends on one of the truly dumbest claims used to deny global warming: It’s cold outside. Yes, seriously. Rubio has also said he can’t be sure the Earth’s not 6,000 years old (and he used the deplorable and disingenuous “I’m not a scientist” line while doing so). When confronted on that, he then gave a mushy answer that did little or nothing to assuage any misgivings. He confused religion and science, or at least claimed he did; it’s hard to know if what he said was what he honestly believes or what he felt was politically expedient to say. Either way, someone who has no problem saying he denies the role of human-generated pollution in the changing climate has no business being in charge of NOAA. And yet here we are. The GOP controls both sides of Congress and is also the arguably the most anti-scientific group of politicians this country has seen in decades. Their ability to obstruct any progress on climate change was strong even when they only held the House; now that they control the Senate they may be able to actively reverse forward progress we’ve already made. After all, the first priority on the agenda of the new House was to give the go-ahead for the Keystone pipeline; the correlation between “yea” votes and funding from fossil fuel is unsurprisingly very high. As an aside, President Obama has said he will veto that bill, and it looks like the Senate may lack the votes needed to overturn such a veto. We’re just getting started here, folks. I can’t imagine what disasters the GOP will wreak with these new powers. And that’s only dealing with climate change. When it comes to other basic issues, I’m very concerned indeed … and already putting my hopes in 2016. The next two years are going to be a very difficult uphill climb. *Yes, I know a lot of people will say that would be a good thing. That’s not the point of the analogy, folks. Stay on target.